In anticipation of the release of the Territory War update, we are sharing some more details about the game mechanics. Get prepared for the ultimate Guild vs. Guild showdown, Territory Wars, a new guild event that pits your Guild and collection against other Guilds and their collections for the true test of who is on top! Anticipate regular changes to keep gameplay varied and exciting! These could include unique unit bonuses and Platoon Missions. 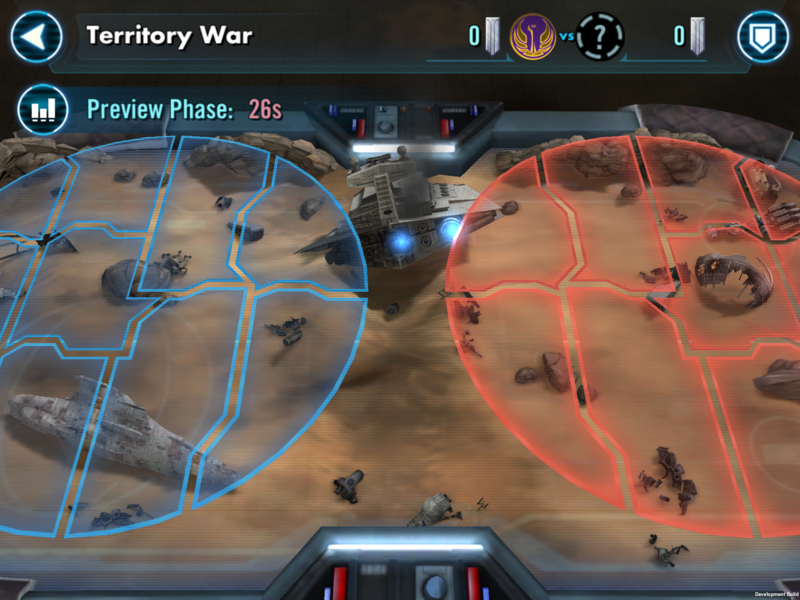 Several Territory Wars will occur per month at times that Territory Battles are not occurring. In this event, players work together to defend their Guild’s territories and attack the opponent’s territories. This is done through assigning defensive squads/fleets to protect your territories and using squads/fleets to attack your opponent’s territories. 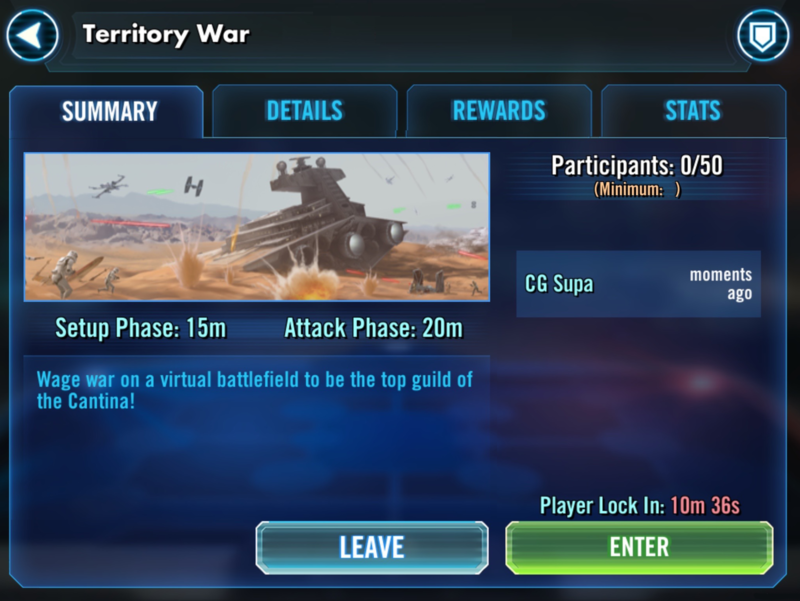 Territory Wars have a sign up period and two primary phases, with each phase being 24 hours long to accommodate members across timezones and availability. Preview Phase: This is a period where each player joins the event. This is to ensure that matchmaking accounts only for players that plan to participate. In this phase the map details can be viewed, but no actions can be taken until Player Lock, which is the end of the preview phase. Player Lock: To provide a fair matchmaking experience, any progression on units (ex. Promotion) that occurs after the preview phase has ended will NOT be reflected on that unit's progression in this event. For example, if the unit was 4-star at the moment of Player Lock, it will remain 4-star within this event even though it is 5-star in other areas of the game. This is to prevent a variety of exploits such as removing all mods before matchmaking, getting a weaker match, and then replacing them all. Matchmaking: A very short Matchmaking period (~1 minute) will pair 2 guilds using a combination of factors including the number of players and the strength of their rosters. Participant Minimum: A minimum of 25 members are required to initiate a Territory Battle. Leaving: Players can leave a Territory War up to the point of Player Lock. Setup Phase: This is a period where players assign their defensive squads/fleets to protect their territories. 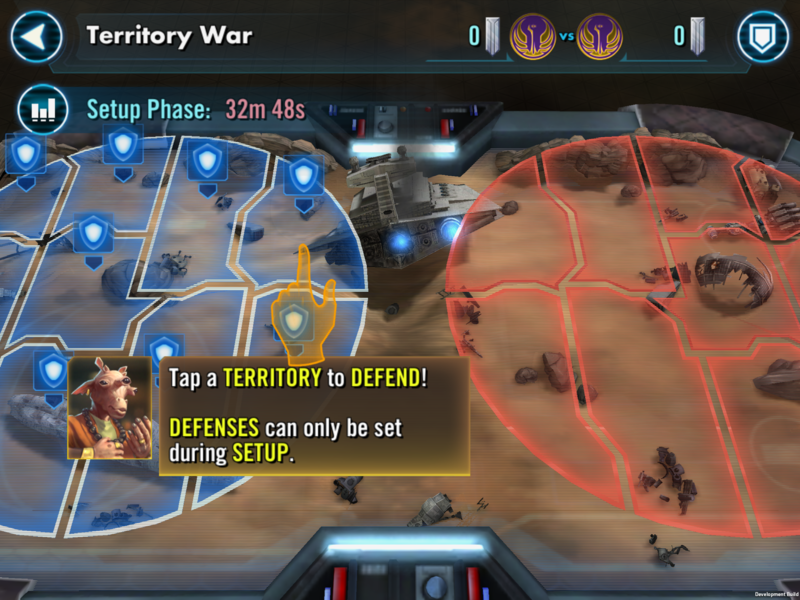 Unlike Territory Battles, units do not refresh in Territory Wars, so it is important to save units for the attack phase. Also unlike Territory Battles, all contribution limits, such as the number of defensive squads that can be assigned, are Guild limits not player limits. This will allow the flexibility for guildmates who cannot participate in the whole event to take on a “defensive role” and place all their troops down or “attacking role” and focus on offense. To ensure everyone understands that units do not refresh between phases, a message will appear when more than 1/3 of the eligible troops have been placed. The message reminds the player to save some troops for the attack phase and can be ignored. The number of defensive squads/fleets that can be assigned to a territory is based on the number lowest number of members between the two Guilds. Attack Phase: In this phase, players attack their opponent’s defensive squads on the front territories. Defensive squads have persistent health exactly like Galactic War so players need to work together to defeat the opponents. 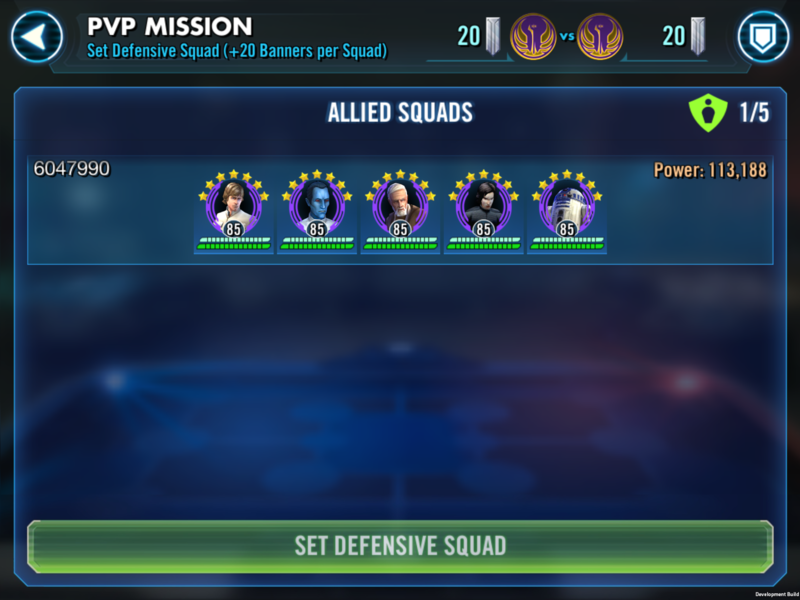 Unlike Galactic War, to prevent any one meta squad from dominating the map, attacking squads that successfully defeat an opponent are not available for future attacks. Once all the opponent’s Defensive squads have been beaten in the available Territories, the Guild conquers the territory “pushing” to the next set of Territories. This will allow the guild to complete the Territory War Attack Phase as quickly as they choose. Review Phase: A period to review the final status of the event. Players earn banners for a variety of actions including setting a defensive squad, successfully defeating a defensive squad, and conquering an opponent’s territory. The winner of the match is based on the guild with the most banners at the conclusion. Players earn rewards based on a combination of the cumulative Galactic Power of their participants and the win/loss status. This is to reward both winning and the difficulty of the match. All rewards will be equally distributed to all members of the guild who have participated in the Territory War. Player contribution of banners is tracked in Stats. 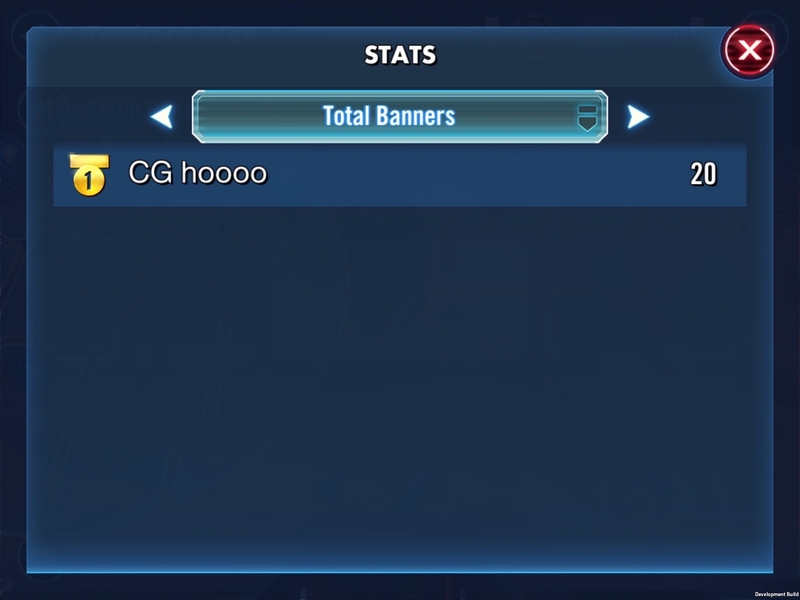 Guilds that win a Territory War will be placed on the leaderboard based on the Galactic Power of the opponent they defeated. Additional wins are cumulative. We take cheating very seriously and will suspend or ban players that are caught cheating. To help us in identifying cheaters, a Guild Leader or Officer can report their opponent Guild if they suspect them to be violating the terms of service. Misuse of this feature, such as reporting a guild with no evidence of cheating, will also result in disciplinary action. We are excited to see how Guilds bring their best strategies to this new map and reign victorious over the Cantina. See you on the Holotables very soon!